This Mexican Caesar Salad will become a summer salad go-to. 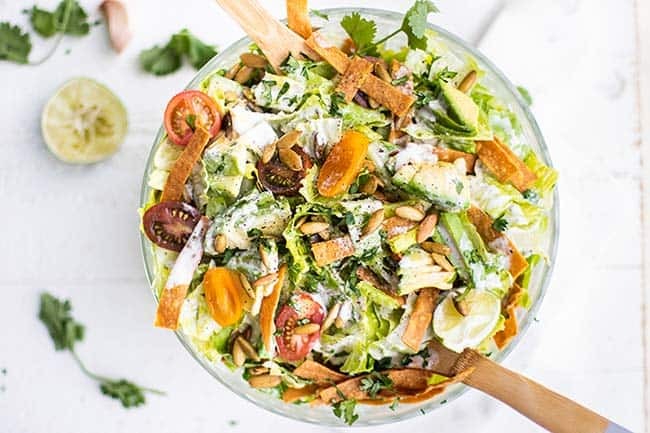 A creamy and tangy lime vegan caesar salad dressing coats crunchy romaine, sweet tomatoes, and crunchy tortilla strips and pepitas. Add some crumbled cotija cheese or pepperjack if you’d like, but this vegan caesar has plenty of flavor without it! Caesar salad is one of those things that everyone seems to love. I have been wanting to make one with a vegan dressing for a long time — but today when I looked at my giant Costco-sized pack of crunchy romaine lettuce, all I could think about was putting a Mexican twist on it! 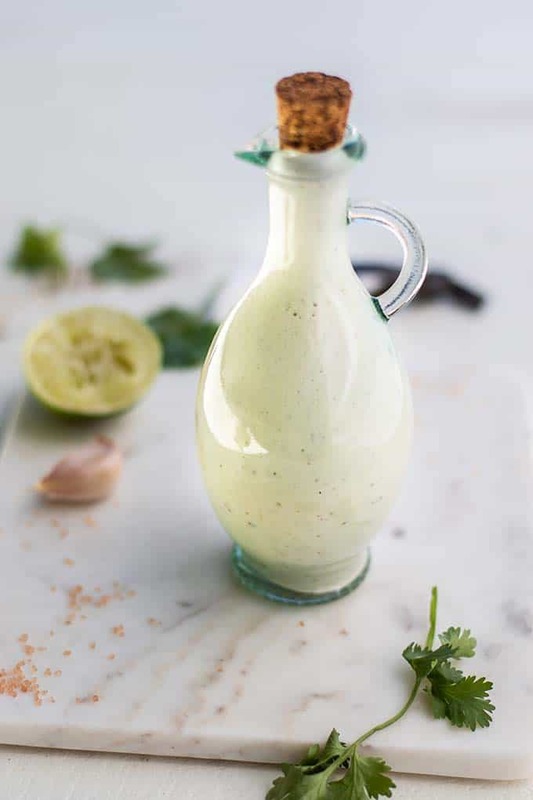 You certainly could save time by using your favorite caesar dressing (if choosing a non-vegan option), but I would recommend adding a few squeezes of lime juice and a pinch of cumin to it. 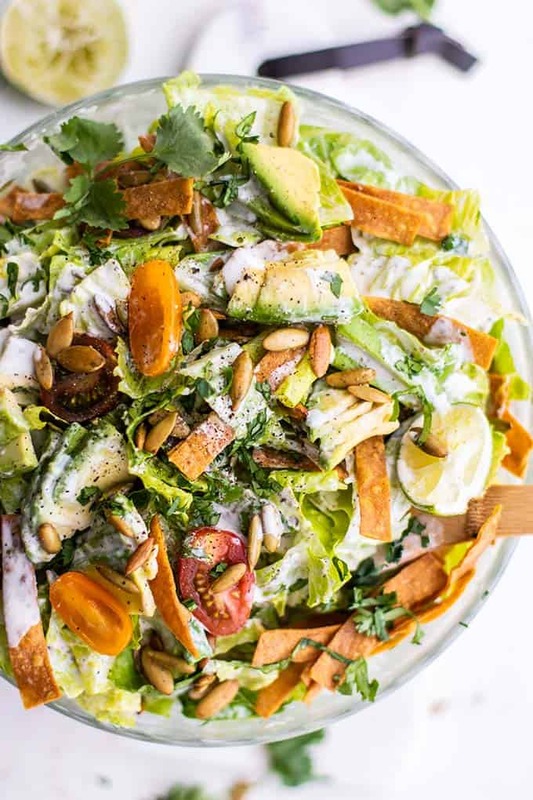 The limey vegan caesar dressing version I made for this salad is super simple to make — just plan ahead and soak some cashews overnight! If you have a high speed blender, you can get away with just soaking them in boiling hot water for an hour. You’ll be shocked how similar this cashew caesar dressing is to the real deal! I’ve kept in the flavor essentials – garlic and dijon — but taken it up a notch with LOTS of tangy lime juice, a pinch of cumin, and a tiny bit of heat from some Cholula hot sauce. The anchovies stay out, but the saltiness is replaced by briney capers. What Makes this a Mexican Caesar Salad? While definitely an American invention, this salad is bursting with Mexican flavors, like cilantro, lime, and fresh juicy tomatoes. The toasted and salty pepitas (pumpkin seeds) and baked tortilla strips replace the typical croutons and give this salad irresistible crunch! The toasted pepitas and tortillas strips are essentails – but you can save time by using your favorite tortilla chip. 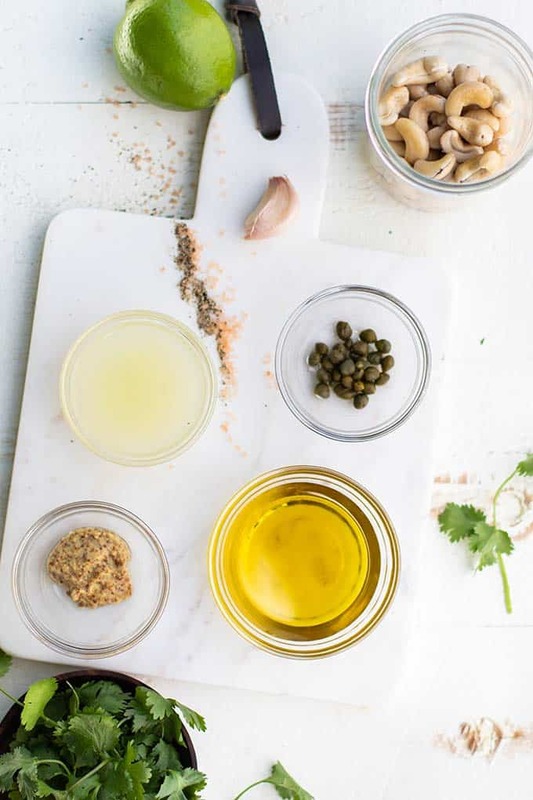 Cover these ingredients in a creamy, tangy, briny dressing, and you’ve got a fun Mexican twist to everyone’s favorite salad. 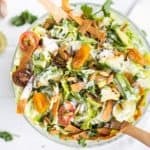 I kept this Mexican Caesar salad on the simple side, – but you can add more veggies to give this a more chopped caesar salad feel. Chopped bell peppers or sliced olives would both be great additions. 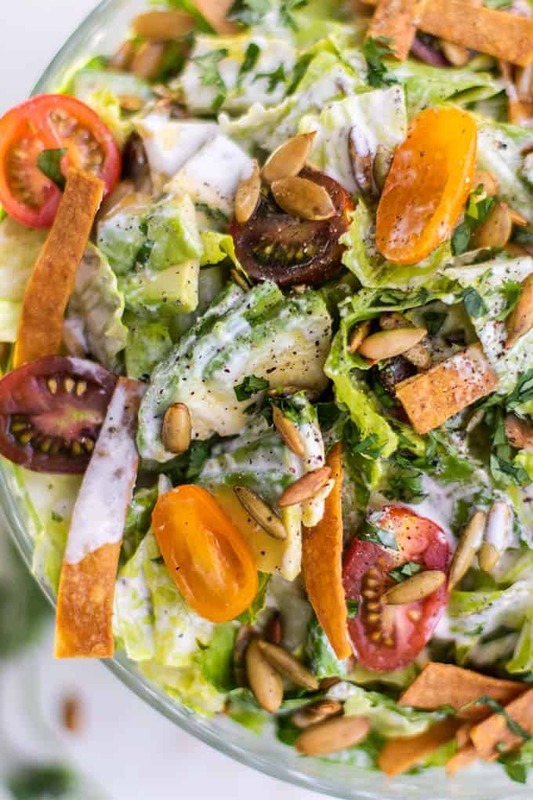 This summery salad gets protein both from the cashews in the dressing and the pepitas on top. Because of the healthy fats, a large bowl of this salad makes a very satisfying light meal. On the side of a Pumpkin Seed Veggie Burger. Meal prep this salad by packing the salad and dressing separately. I like to keep the pepitas and tortilla strips off to the side as well until just before serving. Add a hard boiled egg for the perfect vegetarian meal prep lunch. Make it Vegan: To keep this salad vegan, use the dressing recipe provided rather than a store bought version. Make it Paleo/Whole30: This can easily be a Whole30 Caesar Salad just be omitting the tortilla strips. Add extra pepitas to add extra crunch! Be sure to check dijon mustard for added sugars. This easy and summer salad is loaded with Mexican flavors! 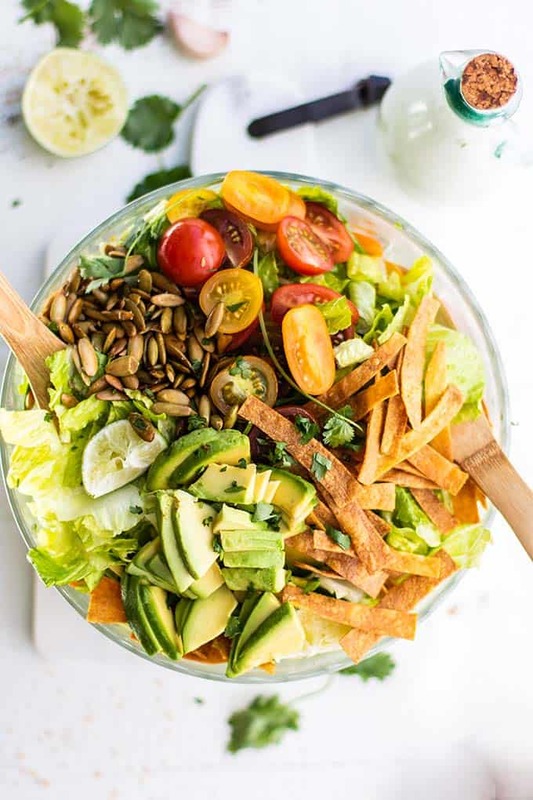 I've kept things simple, and topped crunchy romaine with juicy tomatoes, creamy avocados, and crunchy pepitas and tortilla strips. Sure to become a new family favorite! 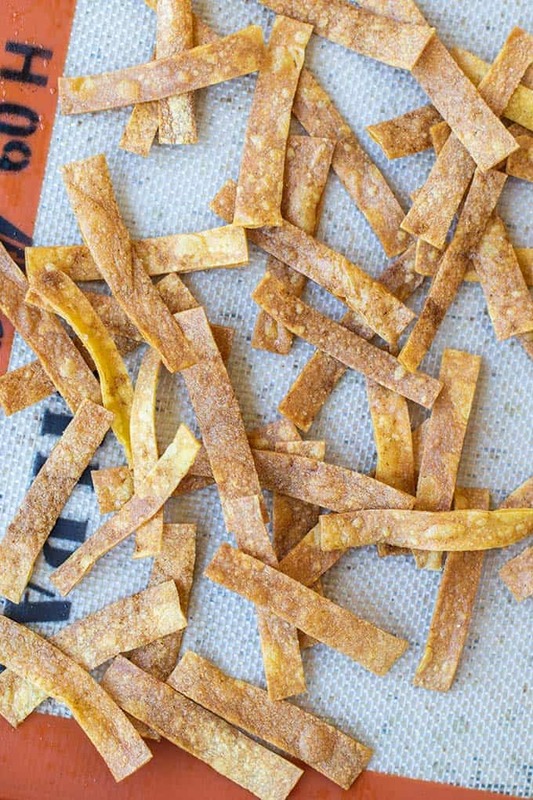 On a baking tray, spread out tortilla strips. Lightly spray with olive oil, and then season with sea salt and cumin to taste. Bake for 5 minutes. Add pepitas to the baking tray along with the tortilla strips, and spray lightly with olive oil and sprinkle with sea salt. Bake for another 10 minutes. Open the door to allow some heat to escape the oven, and then allow the pan to sit in the warm oven to completely crisp up the tortilla strips while preparing the rest of the salad. Make the dressing by adding all the ingredients to a blender, and processing until very, very smooth. I find that I have to scrape cashew pieces off the side and lid of my blender once before it all breaks down and becomes a smooth and creamy dressing. Set aside. 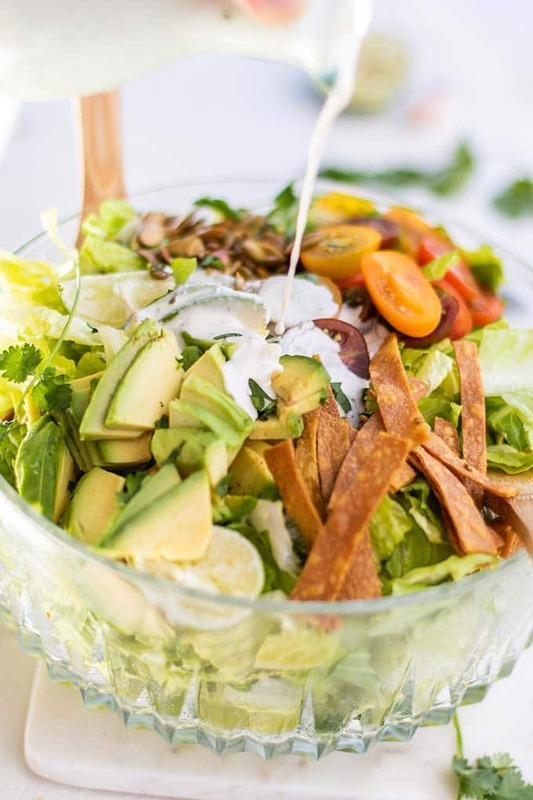 In a large bowl, add romaine, tomatoes, avocado, pepitas, tortilla strips and cilantro. When ready to serve, toss with the Mexican caesar dressing. *I love this dressing made with Cholula for a spicy and vinegary kick. Use red wine vinegar if you don't have it. **The nutrition facts for this recipe include using all of the dressing. I find the salad only needs about half of the dressing. This Mexican Caesar Salad post may contain affiliate links, meaning if you make a purchase, I will receive part of the sale as a commission. This helps me continue to bring you lots of fresh and inspired recipes!